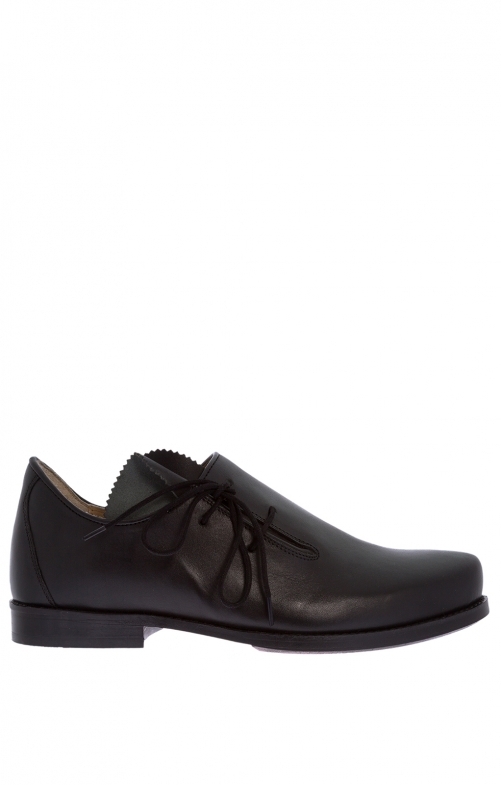 Dashing black leather brogues. These dishy genuine leather brogues are splendidly equipped to take on the most elegant occasion. The side tongue is zigzag trimmed, the leather lacing lacks metal eyelets, the welt on the sole is garnished with running stitch and the toe box is raised and hardened for a comfy fit. The top line is lowered around the ankle to make dancing easier, and the counter doesn't have any pesky pull straps to get in the way of you having fun. The outsole is slightly curved and the heel is raised slightly to get you into the swing of things faster. Klasse, ja elegant aussehender edler Haferlschuh. Er will allerdings noch eingelaufen werden. Mit seiner Ledersohle sehr gut für Volkstanz u.a. geeignet. Gute Qualität! Schuhe müssen noch eingegangen werden. Die Qualität des Schuhes entspricht der Beschreibung ob das so ist, kann aber immer erst nach längerer Tragezeit beurteilt werden. Ich werde sie weiter empfehlen.